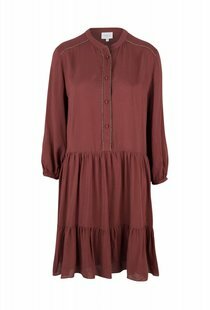 The Dante6 Byram Plain top in Maroon has playfully ruffled sleeves. Has a round neck that can be closed with a concealed button fastening, two side splits and is detailed with cords finished with a golden thread. Pair with the matching Sunny skirt for an easy summer look.